Whether or not you think the iPhone 4 can be considered a serious camera, it is, after all, a camera and it captures images in a similar manner to all the Point & Shoot cameras and all the DSLR’s. Where the iPhone4 really shines is that it’s fun, adaptable, portable and unobtrusive. Going out for an evening of fun and you want to take photos of your friends? You have your iPhone. You’re at a birthday party for your child’s friend and forgot your camera? Take photos with your iPhone. If you have an iPhone you probably always have it with you. Because you do, you always have a camera with you and not only does it take pictures but there are hundreds of apps as discussed in the last post and lots of gadgets that you can buy. For this article, I’m going to concentrate on one app and three add-on lenses. 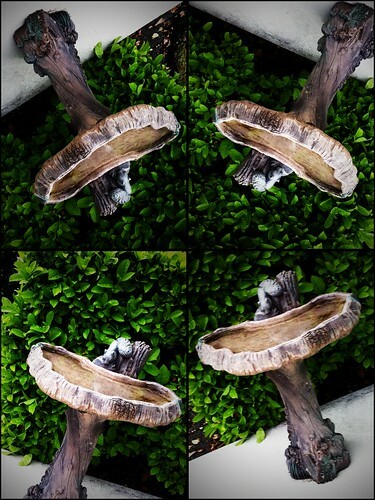 The app is QuadCamera – MultiShot. It sells for $1.99. The fourth release in the series of Takayui Fukatsu’s ToyCamera allows you to take continuous shooting with high quality effects. In 2009 this app was the winner of Best App Ever Award and the 2009 Best Photography App. QuadCamera will take either 4 or 6 photos at one press of the button. The 4 photo option appears to fit better with the iPhone than the 6 photo option. 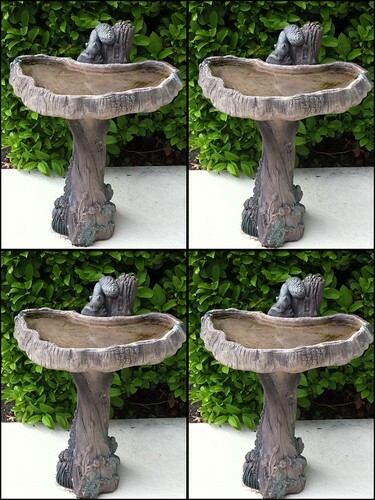 This photo of the birdbath shows the result of taking a photo with the QuadCamera app. You can adjust the speed at which QuadCamera captures the images from 0.20 seconds to 3.0 seconds. The image above was taken with a 0.50 second time between captures. For the next image I set the interval timing to 2.0 seconds so I had time to turn the camera (iPhone) and re-compose the image before the capture. You can also select from 6 preset color/exposure settings. For everyone that’s really tired of the winter weather, I included the next two images to demonstrate two different color/exposure settings and to feature some of the palm trees in my back yard. 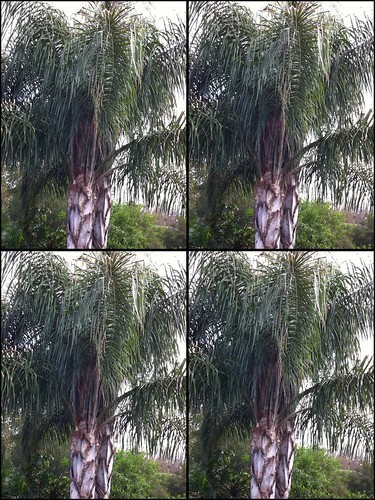 QuadCamera is a fun app but not overly practical. However, I think it’s possible to capture an interesting series of images, especially, if the subject is moving. 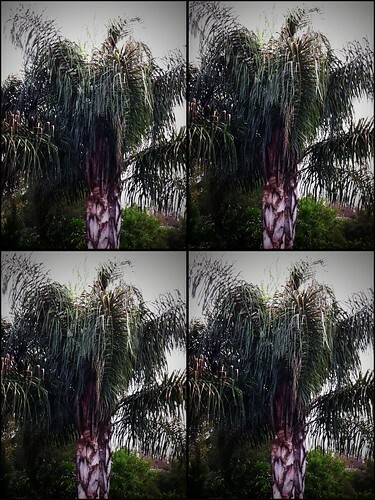 If you don’t already have QuadCamera I recommend adding it to your collection of apps on your iPhone. For the gadgets I ordered three add-on or “stick-on” lenses from PhotoJoJo Store. If you’re not familiar with this interesting site, I recommend you visit PhotoJoJo Store and check out the products they have available. Most of the products are either for having fun with your camera or tongue-in-cheek items. For example, when I ordered the three lenses I also ordered a coffee cup that is a very accurate copy of one of the lenses for my DSLR. They have both a Canon and a Nikon lens replica coffee cup. The three stick-on lenses are called Jelly Lens and come in three different models – starburst, wide angle and 6 image mirage. The diameter of the lens is about the same as a penny and has a key chain style lanyard with a clasp for attaching to your phone. The side of the lens that attaches to your phone has an O-ring of a soft plastic (hence jelly lens) that sticks when pressed against the phone over the camera lens. Each lens costs $5 and is shipped in an easy open package as seen in the photos below. I was excited to try out these lenses when they arrived. I thought the packaging photos for the 6 image mirage and the starburst were quite interesting and the wide angle lens can be used as a fish eye lens as well. Unfortunately, at least for me, the O-ring or adhesive wouldn’t remain stuck to my iPhone. I tried all three lenses with the same result. I also tried gently cleaning the O-ring with soapy water as directed on the back of the packaging but it still wouldn’t stay on the iPhone. I don’t know if all three lenses were defective, which I doubt, or if the glass casing on the iPhone 4 is so highly polished that the O-ring can’t form a strong enough bond to the casing. So, try again. My wife’s iPhone is a 3G that’s about 2 years old that is made with a different material for the back case. I borrowed her phone and tried sticking the lenses on it. Unfortunately, I had the same result. All this was disappointing because I really wanted the lenses to work so I take a number of photos with them. However, I was able to find some images on Flickr and have included them below. Here is the reason I was really wanted to use the lens. 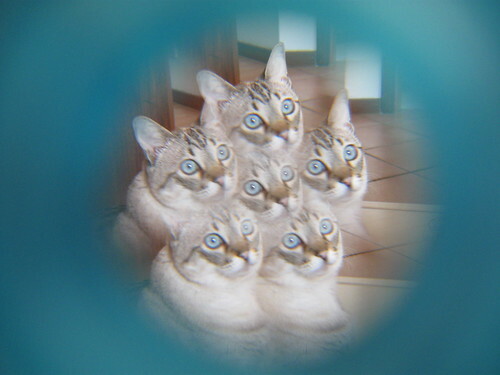 This is a photo of a cat using the 6 image mirage lens. 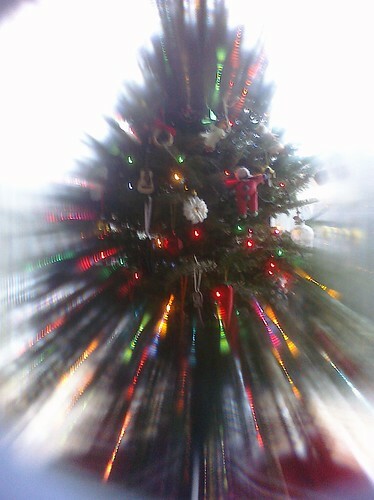 This image was captured using the starburst lens. 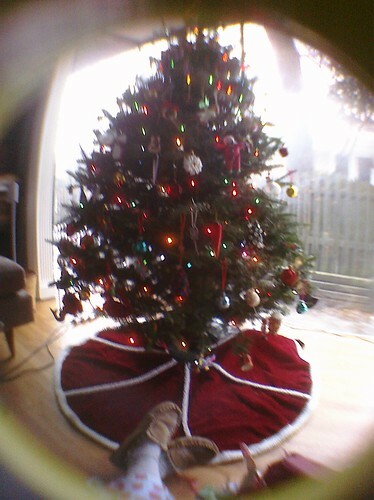 And this image was captured using the wide angle/fish eye lens. As you can see, the Jelly Lenses have the potential for a few hours of fun using the special effects they provide. I think they’re worth the $15 for the set and maybe you’ll have better luck with them than I did.